The stainless threaded reducers allow a change in the pipe size. A stainless threaded reducer is the component in a pipeline that reduces the pipe size from a larger to a smaller bore (inner diameter). The length of the reduction is usually equal to the average of the larger and smaller pipe diameters. When it's necessary to meet hydraulic flow requirements of the system or adapt to existing piping of a different size the best choice is to use threaded stainless reducers. 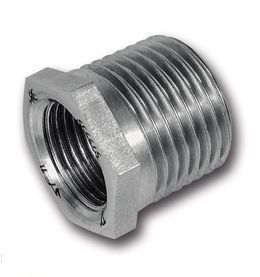 Stainless threaded reducers can also be used to change the type of the thread from NPT to BSP or others and attach to the pipeline a threaded fitting which is compliant with another thread standard.